Early Years | Koch Enterprises, Inc. The history begins with George Koch, the founder of George Koch Sons, Inc. George was born the fourth son of five to Phillip and Anna Margaretha Koch of Albig, Germany. The Koch family set sail from their German home to come to America in 1843. Their plan was to reunite with family members in Evansville, Indiana. Young George was always in search of an adventure. Every year it was his custom to build a flatboat, load it with handcrafted merchandise, and float down the river to trade with townspeople. One year, George decided not to return to Evansville. He had sold everything aboard his flatboat by the time he reached Vicksburg, Mississippi and decided to call this home. When the Civil War broke out in 1861, George drafted in the Confederate Army. Little did he know his four brothers were fighting on the opposite side in the Union Army. Fortunately the men never came face to face. After the war, George married and started a small tin shop in Vicksburg. In 1872, a tragic fire destroyed his tin shop, and shortly thereafter, George and his wife Anna decided to board the Robert E. Lee Riverboat to return to Evansville, Indiana. In 1873, George Koch established the George Koch Tin Shop in Evansville with financial support from his family. In 1903, George Koch died, and his wife, Mary C. Koch, became president of the company. In 1904, Mary and her three sons incorporated the company name from the George Koch Tin Shop to George Koch Sons, Inc. in honor of their father. All three sons and their mother were directors and officers. Louis was elected secretary and treasurer. Though the name had changed, the sons maintained their father’s philosophy of hard work, quality, service, and innovation. In 1906, Albert, the youngest brother, was elected as president. Albert’s older brother, George W., became vice president. 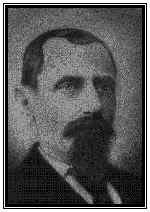 Louis J. remained secretary, treasurer, and manager while Mary remained as a director. The same year George died, 1903, Louis married Clarice Ashburn. Over the years, thecouple had nine children, Roderic Malcolm, George Ashburn, Mary Ellen (Helen), Robert Louis, William Albert, Martha Lois, Amelia Virginia, Katheryne (Kay), and Louis Joseph, Jr. (L.J.). Because of his children, Louis was able to use his talents to keep George Koch Sons thriving during World War I. During Christmastime in 1914, no toys were imported from Europe. Louis experimented and developed tin horns as Christmas presents for his children. Orders began pouring in, and George Koch Sons began production of its first mass-produced manufactured product. After World War I, the sales of tin horns slowed down and George Koch Sons stopped production. Fortunately, Louis came through again. Louis had formed a valuable relationship with Mead Johnson, Sr. who owned a company located two blocks from George Koch Sons. Louis solved Mead Johnson’s production problem of their number one selling product, Dextro Maltose, a nutritional drink. Mead Johnson, Sr. showed his appreciation to Mr. Koch for his achievement by guaranteeing all Mead Johnson jobs in Koch’s line of work. Their relationship lasted almost two decades through the 20’s and the 30’s, and Koch provided them the services needed day or night. Toward the end of the 30’s, Louis’ oldest son, Malcolm, introduced George Koch Sons’ s second manufactured product, metal floral containers. Based on the experience gained in the production of tin horns, a process was developed to manufacture metal floral containers. The new floral containers were in demand. Production expanded rapidly, and soon GKS products were sold to florists all over the country. With aggressive monthly advertising, George Koch Sons became the largest manufacturer of floral metalcraft in the world. 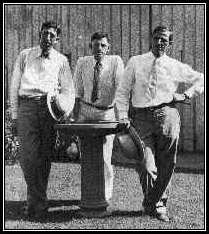 Each of the sons worked after school and during the summers at the company, and following college they became permanent employees of George Koch Sons. This succession of family helped provide a steady growth during a period when other businesses failed. New ideas joined with age-old skills kept the company expanding.